Woodworm in Bristol, Weston, Gloucester and surrounding areas: if your property is suffering from woodworm in Bristol, Weston, Gloucester and surrounding areas, contact Cotswold Treatments (PP) Ltd today for an expert diagnosis and solution. Treatment comes in many forms. For many decades the basic treatment comprised pressure spray application with upgrades to this technique by the application of deep penetrating emulsions and gels. The evidence of wood boring infestation is identifiable in various ways i.e. holes, frass (particularly during the flight period) and deterioration of the timber surfaces and profiles etc. 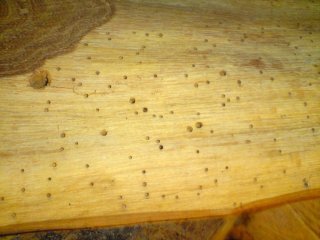 We use the common phrase woodworm but this could cover several species. In the majority of cases the evidence of infestation would be by the Common Furniture Beetle (Anobium Punctatum) with perhaps the most famous beetle of all particularly related to the United Kingdom, Death Watch (Xestobium Ruflovillosum). Some wood boring beetles will enjoy different species of timber and are also affected by conditions. We are specialists in the field of remedial and preservative treatment of structural timbers, joinery and other woodwork in-situ having wide experience in dealing with the problems of Death Watch Beetle, the Common Furniture Beetle and other wood-boring insects. Usually treatment is applied in the form of fluids, with other forms of treatment being applied by deep penetrating emulsions and pastes. All of our timber treatment chemicals are low odour, water-based and biodegradable in line with EU Regulations. Further forms of wood-boring infestation eradication can be effected by the use of smokes, but this latter technique normally incorporates a series of treatments and is generally used as an alternative to standard treatment applications, particularly where spacious roof structures prevail, such as in churches or similar buildings.